Summary: Moving from Prince George to Abbotsford, British Columbia for her mother’s work leaves Zoe less than impressed. When she starts a new school, she is taken under Beck’s wing, a girl with a group of loyal followers who are eager to do what she tells them to. Initially attracted to the Beckoners as they are called, things take a turn as Zoe encounters their darker side – the bullying of a girl they call Dog, the boyfriend who rapes members of the group, and the initiation ritual. The more Zoe learns, the less she wants to do with them, but getting out and beating the Beckoners at their own game is going to take ingenuity, courage, and pain. 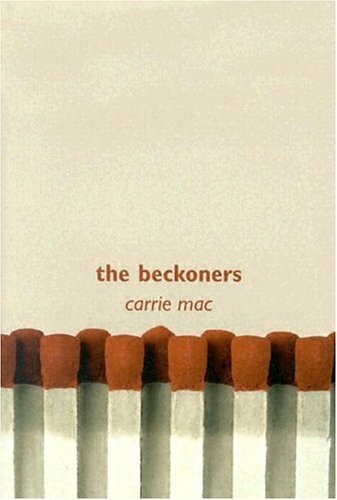 Review: I’m up to three Carrie Mac books read (counting titles read outside of my Marathon of Books) and what they all have in common is that I simply can’t put them down. The Beckoners is no exception. Zoe lives with a self-involved mother named Alice who leaves the care of Zoe’s baby sister Cassy mostly to her. Moved to yet another place against her will, Zoe is understandably upset and resentful. This resentment meets up with Beck who knows how to harness it, and Zoe becomes a Beckoner. Not because she necessarily wants to be, but because she is egged on by group dynamics and wanting to prove herself. Beck, the villain of the story, is oddly sympathetic. Yes, she uses her personal pain as motivation to surround herself with a gang and become the most feared person at school, but even she seems to know when they’ve gone too far. Her home life is abusive, and it seems Beck may have learned how to inflict physical and emotional pain from personal experience. April, the victim, has moments when she directly antagonises her bullies. She does it on purpose, trying to get revenge, but her attempts only land her in more trouble time and time again. Zoe is the outsider who bridges the gap between the two. She may start as a Beckoner, and she may not always like April, but she comes around and realises April still doesn’t deserve to be treated the way she is. I loved reading about Zoe the most because she’s constantly struggling between wanting to fit in and wanting to protect those who need it. The ending is clever, and I was surprised by it and thankful for it. After all that had been done, to April, to Zoe, to Shadow and to Jazz, responsibility and justice were welcome, although it was disturbing how they were brought about. The Beckoners is a compelling examination of the power of psychological bullying, the importance of hope and the desperate need for people to speak up against harmful behaviour. Simon’s rant against Beck was stunning, because finally, finally someone refused to be silent. Zoe’s friendship with Simon definitely helps her get to the point where she can speak out too. And in the end, it can be assumed that justice prevails. 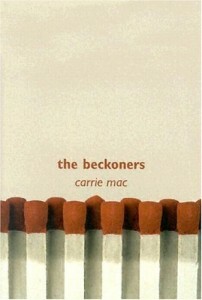 The Beckoners by Carrie Mac is published by Orca Book Publishers, (2004).